For your Thanksgiving feast today, let me regale you with a story about working birds, not the ones you eat, but the ones that bring you food. My Dad liked it when people were working. This apparently applied to birds, too. He often described to me his visits to Japan and the marvels that he was privileged to witness there. Obviously, these trips reached him on some deep level. Looking back, I can piece together several of these sojourns to the land of the rising sun, based on memory and souvenirs. In my post last week HE WAS RICHLY STUNNED, I recounted how the currency exchange clerk followed him back to his hotel to refund him 50¢ in overcharges. Dad was not the only one who was touched by his experiences in Japan – Gloria was too, and I will circle back to her at the end of this post. The Japanese have a custom where they give each other small presents or keepsakes on the occasion of significant meet-ups. It denotes respect and dignity for the relationship in a culture that is not outwardly expressive of such emotions. Once, for example, while I was working at Mitsubishi International, my boss’ boss took a personal vacation to Mexico. On his return, he presented every member of the entire department staff – including me – with a small bottle of Mexican hot sauce. In fact, the verb in the Japanese language “to give” is hardwired to imply that one gives upwards to the receiver (ie., the giver is small). Likewise, when you receive a gift, it is understood that you are receiving down (ie., the opposite, the receiver is small). Harmony and grace are the operative assumptions of a culture where the population is crowded together in large cities and personal space is minimal. I have two such keepsakes from my Dad. One is a commemorative coin dated 1968, one of his first visits to Japan (if not the first). Of this bird sculpture (a cormorant), there is a story. The names of his associates in Japan like Dr. Muto or Umeda-san often struck me as being straight out of James Bond movies. I don’t know much about “Dr. Muto” or if Dad ever saw him again. But during his trip to Japan that year, he met the aforementioned gentlemen, ostensibly on patent business. After the customary initial discussions in Tokyo, things got friendly, and being summertime, Dr. Muto invited Dad out to countryside for the weekend. The destination turned out to be Gifu City. “Goofy City,” Dad called it with a tee-hee chuckle, claiming that Dr. Muto was in on the joke. Gifu City is famous for cormorant fishing on the Nagara River, where the tethered fish-swallowing birds dive, swallow fish, and then bring them back to the fishing masters on special boats during nighttime. Godzilla’s homeland always made a huge impression on our family, Gloria and I not excluded. Years later, on my own business trips there, I had a chance to see it for myself. I saw a country that suffered terribly during World War II but had nevertheless pulled together to transform itself into a first rate country. No excuses. You have to admire the Horatio Alger quality of the Japanese people. Tokyo is an enormous stretch of urbanization; it even takes Godzilla several hours to traverse it from northeast to southwest. The structures are for the most part nondescript post-war construction, kind of like Los Angeles, except much taller. Outside of the endless stretch of forgettable urbanization, you can find the real spirit of the country as expressed in its temples and Buddhist shrines. If the ying is the hustle and bustle of Tokyo, then the yang is quiet contemplation of a koi pond in some quiet corner of a shrine. The beauty of such places is sublime. Dad brought Gloria to Tokyo in 1971 during their courtship. I am sure that the megalopolis dazzled her as a first time visitor, especially more so in 1971. As opposed to Europe where you can at least read the signs (to some extent) even if you don’t speak the language, in Japan the western visitor is truly illiterate. (This has changed somewhat today as many signs in the Tokyo area also have English passages for the convenience of the international visitor). However, if you have the right connections, the locals act like spirit guides taking you through the anonymous concrete jungle and into their networks of colleagues and friends. In this fashion, the country can light up like a string of Christmas lights. Dad had that kind of entrée. I am sure that Olcott International’s associates in Tokyo were charmed by Mrs. Olcott in 1971. While Tokyo has been rebuilt in a non-descript international style since World War II, the inherent elegance of Japanese art and style asserts itself through visits to temples, shrines, and museums. 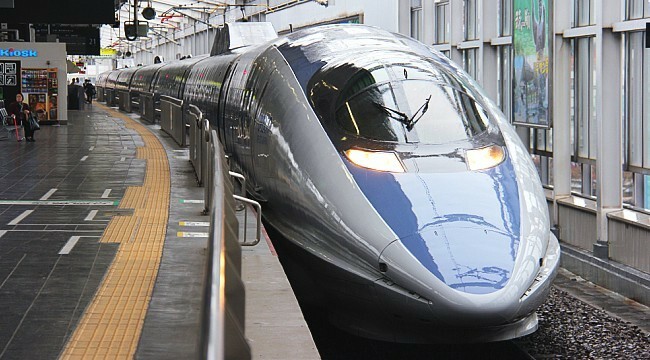 On my first trip to Japan in 1994, Dad insisted on the very next day after the long flight that I get up early and take the Shinkansen (bullet) train to Kyoto. Groggily, I dragged myself to Tokyo Station to take this marvel of modern technology of engineering. Our Acela train may be pretty cool but it doesn’t compare to this moray-nosed rail-riding snake. Gloria was not immune to the enchantment. After a visit to some textile exhibits, Gloria bought 3 ornamental Japanese wedding dresses and brought them back to Weehawken. She soon rehung them on the walls of our Shinnecock Hills home in Long Island, where they were on display for many years. Before the home was sold by the estate, I gave them back to Blair for safekeeping in her mother’s memory. Your story continously keeps to amaze me. Previous HE WAS RICHLY STUNNED!